Practice gratitude. Set positive intentions. Create your sacred space. Free shipping over $25. US only. Looking for clarity, calmness, balance, abundance? Crystals, sacred herbs, flowers, and other medicinal plants are powerful tools given to us from Mother Nature to assist us on our journey, help create a sacred space, and get us balanced. The act of smudging, meditating, practicing gratitude, or setting intentions with your crystals are ways to cleanse the energy around us, raise our vibrations, and tap into balance + alignment so we can clear out the clutter, re-align, re-center, and get back to that place of peace and happiness. 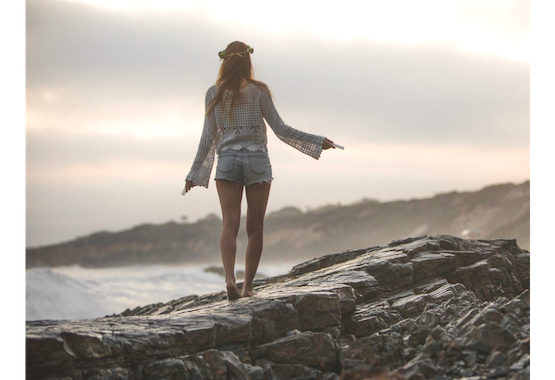 Follow your intuition and discover which intention kit is right for you. Add some extra positive vibes to your bedroom, workplace, or home office. This kit was designed to fill your space with positivity, love, peace, and good energy to start or end your day. Take time to set your intention or choose one word to fill your day with and attract positive energy. It takes 21 days to create a habit. Our gratitude bundle includes 21 sheets of seed paper, your ritual bowl, and a quartz point. 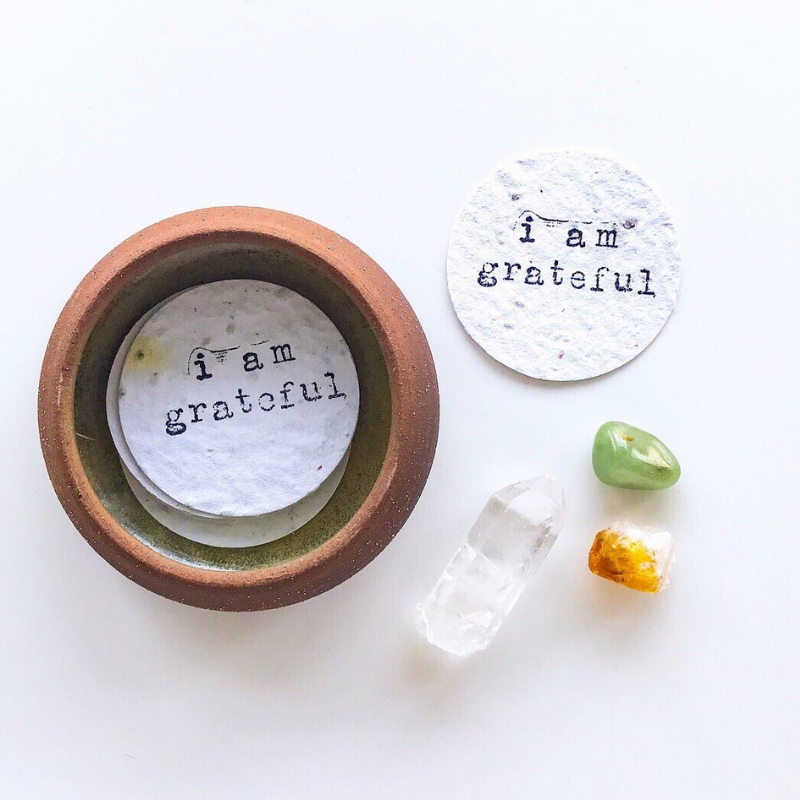 Write down what you're grateful for and, after 21 days, plant your seed paper in your backyard or a little pot and watch your thoughts literally grow into wildflowers. Use this kit to set the intention "I am abundant" and to attract success, luck, and abundance into your home. This kit includes a green aventurine stone, a selenite crystal, palo santo, and white sage and juniper cleansing sticks. If you were writing a letter to yourself 6 months from now, how would you want to feel? What are you doing right now to open your heart, mind, and physical space to feel this way? When you cleanse your space physically, mentally, and spiritually, you open your heart to opportunity, serendipitous encounters, and gratitude for where you are right now. We've curated a special collection of tools to help you create meaningful habits - to bring you back to your intention, cleanse your space, practice gratitude, and to give you a few moments in your day to get grounded. Clear out old, stagnant thoughts and negative energy with new positive thoughts and powerful intentions. As Mike Dooley states, "thoughts become things" and what you choose to focus on grows, so let's choose to focus on what we have today and who we want to be. 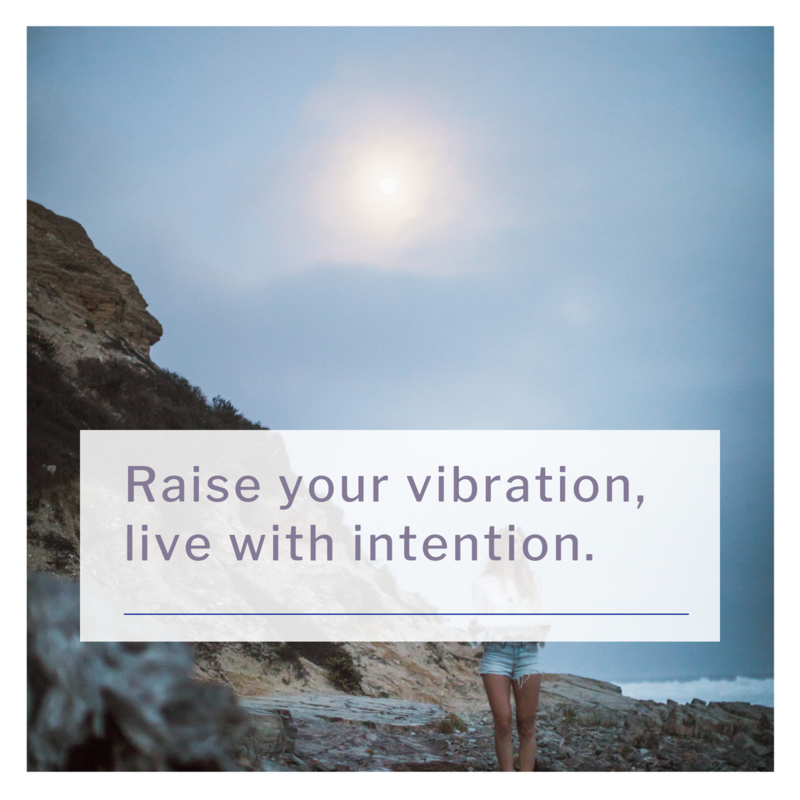 Raising your vibration is about tapping into the best version of yourself and understanding how to re-ground and re-center when you get off track. Sacred smoke, crystals, and other techniques and tools help guide us back to our intuition, to a moment of calm, and gratitude. Our intention kits are handpicked, blessed, + made with love. We do our very best to respect everything Mother Nature has provided for us and carefully source products that promote sustainability and growth. Our Sage & Shungite room cleansing spray helps to cleanse the toxins in the air, purify your space, and boost your mood. Ingredients include all coconut and jojoba oils, organic aloe vera, sage, cedarwood, lavender, and eucalyptus essential oils. Leave your mind, body, spirit, and home cleansed and purified from negative or stagnant energy. Spray your home, office, desk, or vehicle with this uplifting and refreshing room spray. Each bottle is uniquely infused with shungite minerals to boost the cleansing properties in our room spray. 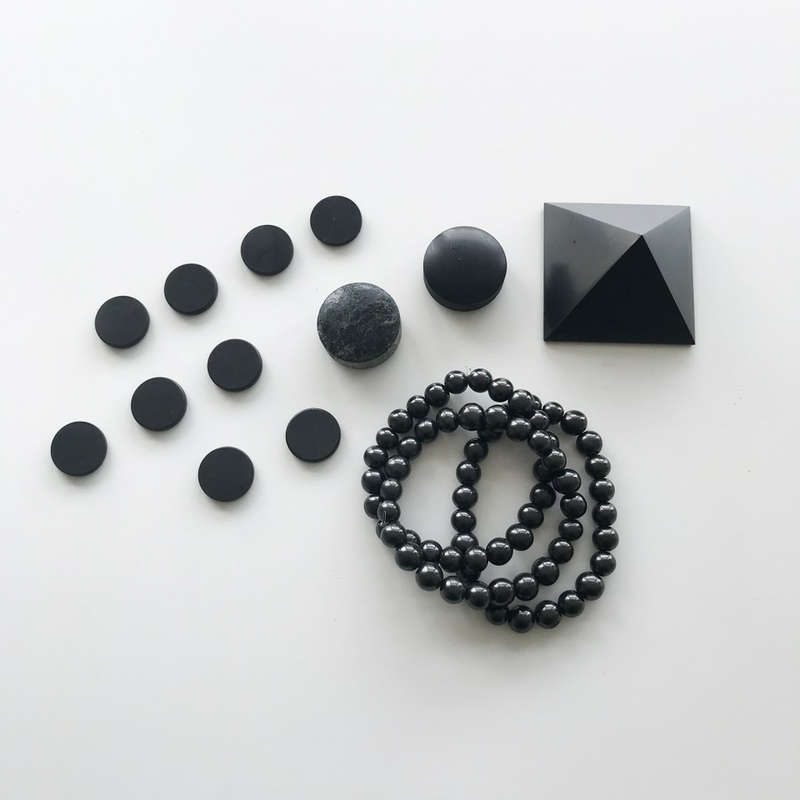 Shungite is an ancient powerful healing mineral known to help detoxify, purify, and protect your body and space. It's also known to diffuse or harmonize EMF (electromagnetic field) emissions from electronic devices. We wanted to make a powerful blend of essential oils and healing tools to ensure that this blend leaves your space feeling calm, relaxed, and restored. Similar to washing your hands, it's important to cleanse and purify the air around you on a regular basis to keep your space cleansed, grounded, and purified. We recommend spraying liberally and repeating as much as needed. 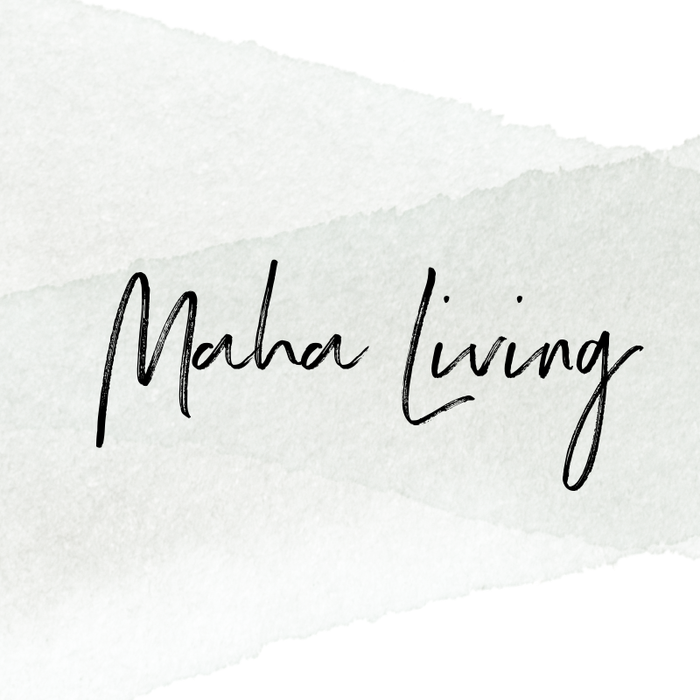 Our mission, here at Maha Living, is to help you create a space and environment that cultivates positive habits, brings you more joy, and inspires you throughout your day. 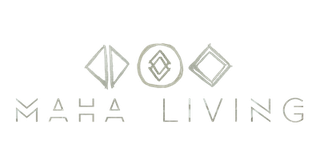 We aim to bring you tools and resources that fill up your spiritual toolbox. Similar to washing your hands, it's important to cleanse and purify the air around you on a regular basis to keep your space cleansed, grounded, and purified. Each kit is handpicked, blessed, and made with love + light. Our intention kits are meant to inspire your self-care rituals and to fill your days with meaning. We're taking a stand and joining the movement of mindfulness so you can grow your gratitude like pretty little wildflowers. Giving Back: for every purchase, a portion of proceeds is donated to Global LifeVision to empower women and children in developing countries. Global LifeVision provides gratitude goats, Christmas cows, and a unique mentorship program that inspires individuals and communities to create their life vision and to understand how their unique talents can impact their community and future generations. Shungite is an ancient powerful healing mineral known to help detoxify, purify, and protect your body and space. Placing shungite pyramids around your home and electronics helps to absorb EMF emissions from electronic devices and protect your space. Take time to set your word or intention to kickstart your morning, before a celebration or dinner party, or for a good night's sleep. We designed this pack to keep your home cleansed from negativity while attracting love and abundance for you and your guests. This kit includes a variety of different cleansing sticks so you can find your favorite - blue sage, white sage, sweetgrass, and palo santo. There are so many wonderful healing herbs, we designed this kit to give you an opportunity to try our personal favorites. I'm new to smudging, which kit should I start with? 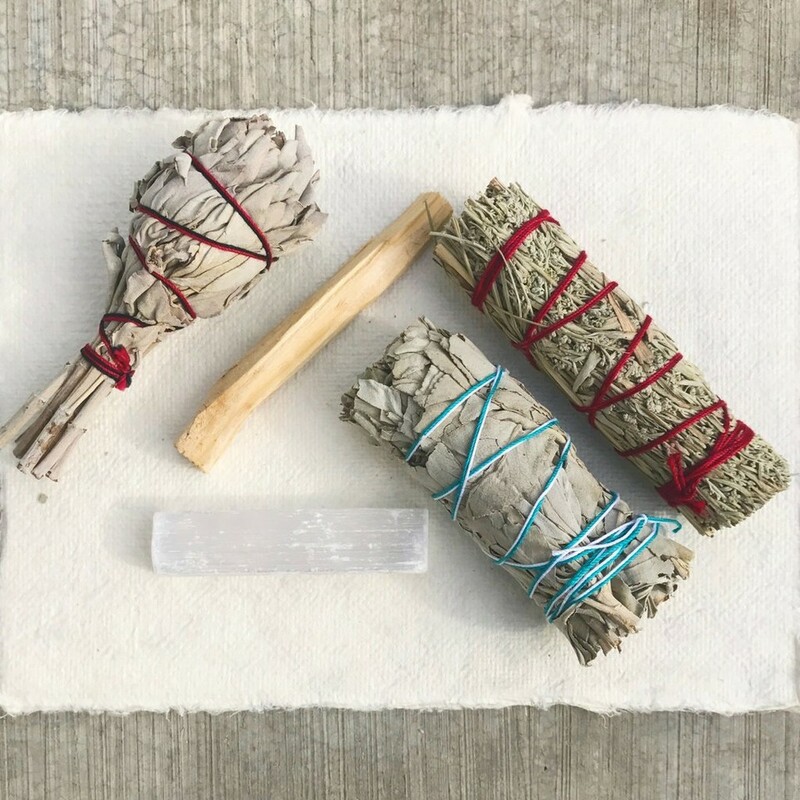 If you're new to smudging or crystals, our favorite starter kit is our "Good Vibes" smudge kit. It includes two different types of cleansing sticks and a rose quartz crystal. Rose quartz is the "love" crystal - self love, confidence, empowerment - and something that we believe you can never have enough! Of course, we always recommend that you follow your intuition - if there's a certain kit calling your name, go for it! Visit our shop and see which kits you're most attracted to or excited about and most likely that's the one you need right now :). What are 10 ways I can cleanse my space & raise my vibration ? De-clutter. Clean out your physical and digital space. Choose one space that makes you feel stressed out or anxious and let go of what no longer serves you. Whether it's your inbox or bedroom, find a few things to delete or throw away. We always recommending smudging your space before and after you do a major de-clutter. 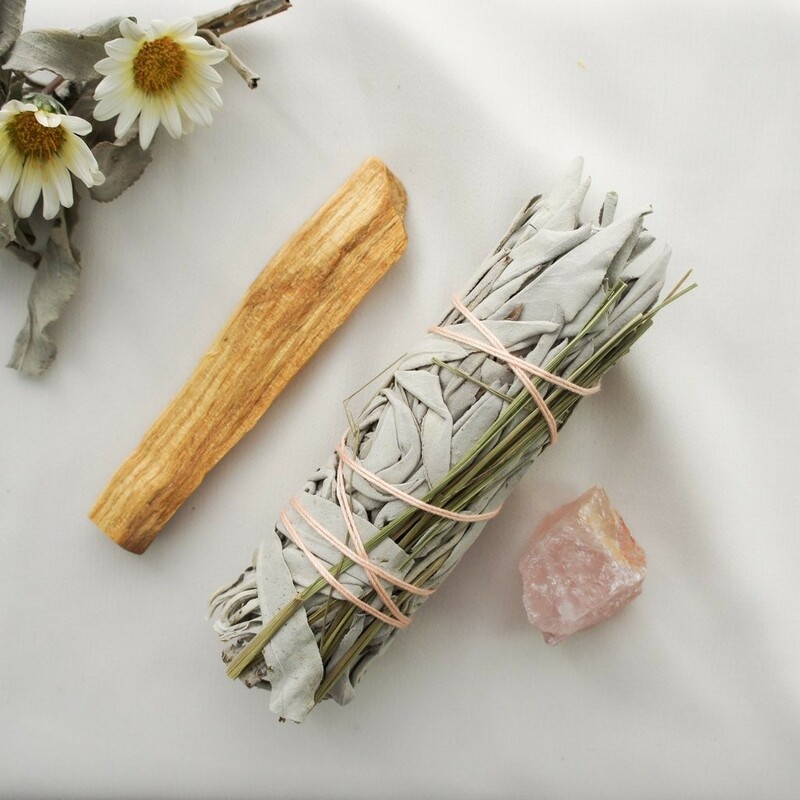 Cleanse your space with the smoke from sage, palo santo, or other medicinal herbs used for cleansing and purifying the air around you. Get out in nature. Go on a walk or go to the park and feel the sunshine on you. Use sound. Find a singing bowl to purify your space. Meditate. Spend 10 minutes visualize your day and how you want it to feel - do you want to feel productive? Effortless? Confident? Successful? Spend time with your favorite healing crystals and repeat your favorite affirmation or intention. Drink a warm cup of tea and spend a few minutes journaling. 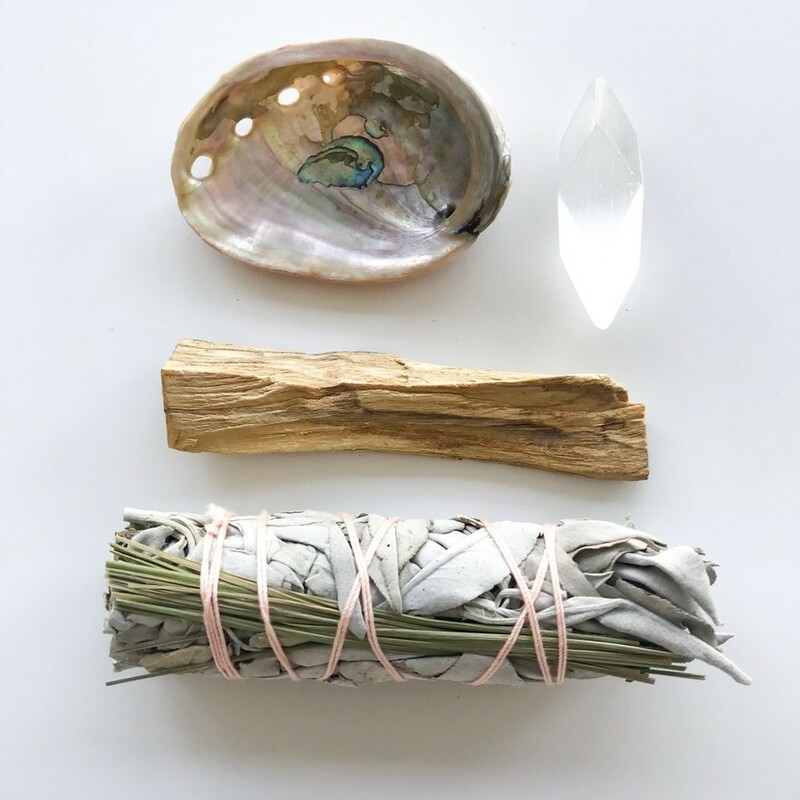 Smudging is the act of burning sacred herbs, flowers, and other medicinal plants with powerful healing properties to cleanse and purify the air in and around your space. This practice has been around for hundreds of years and used by different cultures to clear negative energy. 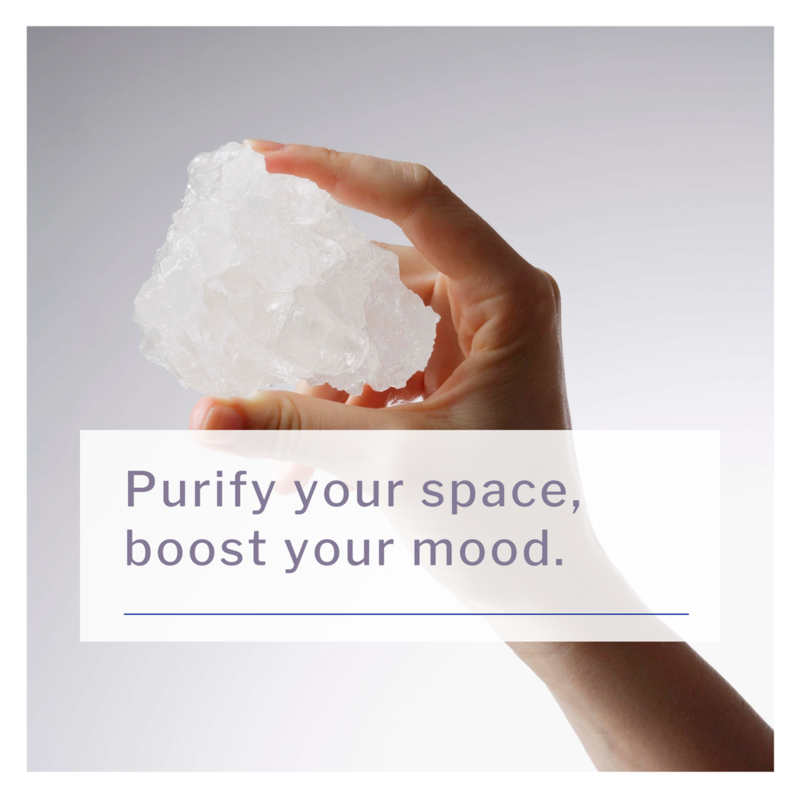 It helps to re-energize, restore, and balance you or your space with peace, calmness, and positivity. A recent study also showed that burning medicinal herbs helped to kill 94% of airborne bacteria for up to an hour or more. A smudge stick is created by bundling together dried herbs such as sage, sweetgrass, or lavender. These herbs have healing properties that absorb toxins and negative energy. Tying the herbs together with a string or any flammable material intensifies the smoke. As you burn the smoke, it attaches to the negative energy in the room and helps to remove it. You'll notice a real difference after burning a smudge stick, both in the way you feel and in the way the room you've purified feels. How often should I smudge or cleanse my space? You can smudge when you wake up, before you go to bed, for special occasions or holidays, before an interview - whatever feels right to you - or, whenever you’re in need of bringing peace and positivity into your space. The energy around you is constantly changing. It’s important to check in and cleanse your space on a regular basis, especially when you’re feeling the need to re-ground and re-center yourself in today’s digital world and busy lifestyles. Similar to washing your hands, it's important to cleanse and purify the air around you on a regular basis to keep your space cleansed, grounded, and purified. Is your sage sustainably harvested? We do our very best to respect Mother Nature and the wonderful gifts that she has provided us with. Choosing all natural sage is extremely important to us. The sage is carefully picked when the weather has become steadily warm-to-hot and the growing cycle is coming into the full flowering season to ensure that the smoke from our white sage is potent and thriving. It is at this point during the plant's cycle that it becomes possible to create new seeds for regeneration to keep the harvest sustainable. Also, when the heat drives down the plant's water-to-oils content ratio, the smoke from from the sage has the strongest potency. Handpicked in California by a member of First Nation’s American Metis, our sage is carefully harvested during the optimal time of the plant’s growth. The fields are blessed yearly to give our thanks and we ask for the blessing of all good things to come from harvesting the newly matured leaf-clusters. Sage should always be harvested properly with love, blessings, and sustainability in mind. Yes! We love when our customers send our kits as gifts - it's so special and we do our very best to make it personalized for both you and your recipient. Please be sure to add your personalized note to the "Notes" section at checkout and we'll make sure your note is shipped out with your purchase. Your items are packed and shipped within 24 - 48 hours of placing your order. Currently, we offer a flat rate shipping fee of $3.95 or free shipping if you spend over $25. Once shipped, you should receive your order within 3 - 7 business days. Your experience is so important to us. If for any reason you're not 100% satisfied, we offer 30-day returns for a full refund - no questions asked. All we ask is that you pay for shipping and handling to return your item. Once we receive your item, your refund should show up on your debit or credit card within 2 - 3 days.